Oxford, Maine – Jeremy Davis of Tamworth, New Hampshire was the dominant car in Budweiser Pro Late Model competition on Buy The Fire Championship Day at Oxford Plains Speedway, cruising to victory lane by a healthy margin in the 75-lap headline event. While a happy first-time winner celebrated in victory lane, Buckfield’s TJ Brackett managed to maintain his slight points lead over multi-time track champ Shawn Martin of Turner to earn his second title in the top class at OPS. The new champion’s father, Timmy Brackett of Buckfield – himself a former king of the top class at the historic speedway – claimed runner-up honors in the Pro Late Model finale. Hebron’s Alan Wilson made an impressive charge through the field on the outside groove to claim the final podium position. Billy Childs Jr., of Leeds, and rookie Kyle Treadwell of Auburn rounded out the top-five. 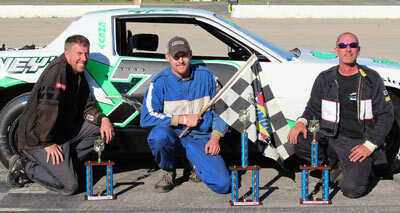 Kurt Hewins of Leeds joined the Allens Coffee Flavored Brandy Street Stock field late in the year and claimed a couple of late-season victories, including Sunday’s 50-lap extra-distance tests. 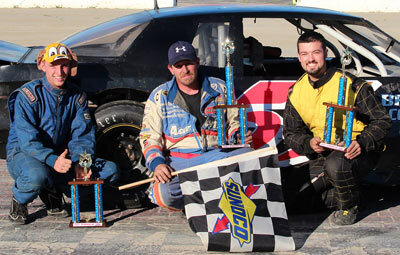 It was the next generation wrapping up the class championship, as fourth-place finisher Ryan Hewins of Leeds edged out a pair of multi-generational Oxford racing family members to prevail in the Street Stock title bout. Kurt Hewins suffered some damage in heat race competition, yet it didn’t hurt his quest for victory in the Street Stock 50-lapper. Behind him, positions and paint were swapped liberally throughout a wildy-competitive, entertaining race. Zach Bowie of Sabattus bounced back from a first lap bobble to pass just about everyone in the field to claim runner-up honors, followed by Spencer Morse of Waterford, a third-generation driver just missing out on the crown. Troy Jordan of Turner wrapped up his championship-winning season in style, claiming victory in the 45-lap points-counting finale for the Ripley & Fletcher Ford Outlaw Sportsman division. Dale Lawrence held off a tough challenge by Mike Haynes to claim runner-up honors. Haynes,Deana Bisbee and Steve Moon rounded out the top five. 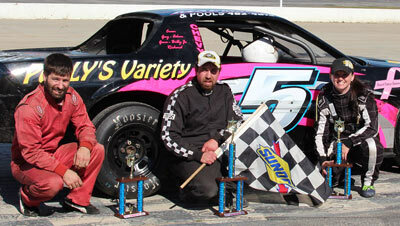 John Childs outran Cam Childs to the checkered flag in a 28-car 20-lap race for the Bandits division. 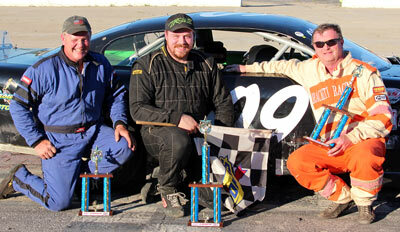 Richard Kimball, Paul Harmon and Rob Lowe rounded out the top five. Eighth-place finisher Derek Cairns claimed the points championship for the entry-level class. 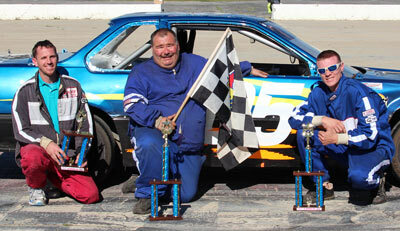 Chris Burgess wrapped up the Oxford Acceleration Series Outlaw division title with a victory in his 25-lap main event. 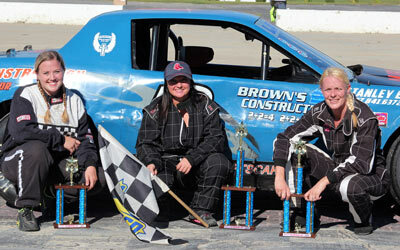 Deana Bisbee and Brady Romano claimed second and third-place hardware, respectively. 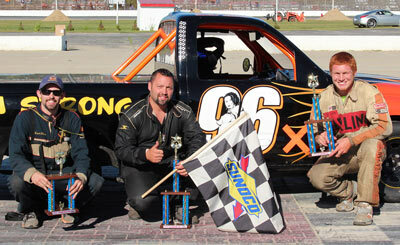 Gerard Cote scored a popular victory in the 20-lap race for Runnin’ Rebel division competitors. Fifth-place finisher Jamie Heath earned the class crown. 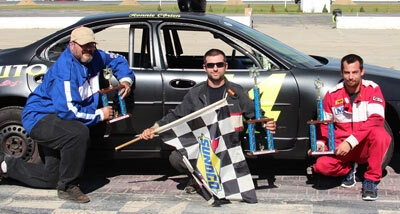 Nate Dubuc and Jimmy Childs both passed a bunch of cars to end up with second and third-place trophies. Shelby Lawrence needed to win in her tight championship battle versus Missy Morgan to prevail in Ladies division competition. Morgan charged back to a second-place finish after spinning while challenging for the lead. Michele Bisbee was the third-place finisher. Ronnie O’Brien won the Cruisers race. Will Dunphy wrapped up the division championship. Budweiser Pro Late Model (75 laps) 1 09 Jeremy Davis, Tamworth, NH; 2 60 Tim Brackett, Buckfield; 3 53 Alan Wilson, Hebron; 4 11 Billy Childs, Jr., Leeds; 5 44 Kyle Treadwell, Auburn; 6 16 Travis Stearns, Auburn; 7 25 Shawn Knight, South Paris; 8 Quinny Welch, Lancaster, NH; 9 61 TJ Brackett, Buckfield; 10 28 Mark Lundblad, Jr., Conway, NH; 11 94 Shawn Martin, Turner; 12 36 Scott Robbins, Dixfield; 13 71 Gary Chiasson, Peru; 14 24 Gunnar Rowe, Turner; 15 54 Shane Green, South Paris; 16 03 Scott Moore, Anson; 17 72 Chris Coolidge, Bryant Pond; 18 6 Tommy Ricker, Poland; 19 3 Vanna Brackett, Buckfield. Ripley & Fletcher Ford Outlaw Sportsman (45 laps) 1 73 Troy Jordan; 2 2 Dale Lawrence; 3 67 Mike Haynes; 4 72 Deana Bisbee; 5 19 Steve Moon; 6 5 Guy Childs, Sr.; 7 39 Gerry Freve; 8 77 Bryce Mains; 9 6 Todd Bisbee; 10 97 Shannon Judd; 11 5x unknown; 12 54 Eric Palmer. Allen’s Coffee Flavored Brandy Street Stocks (50 laps) 1 55 Kurt Hewins, Leeds; 2 04x Zach Bowie, Sabattus; 3 34 Spencer Morse, Waterford; 4 5 Ryan Hewins, Oxford; 5 23 Zach Emerson, Sabattus; 6 36 Richard Spaulding, Lisbon; 7 81 BJ Chapman, Bridgton; 8 48 Curtis Rolando, Newport, RI; 9 17 Gary Davis, Harrison; 10 3 Josh Childs, Oxford; 11 33 Andrew Breton, Sabattus; 12 51 Kyle Hewins, Leeds; 13 777 Mike St. Germain, Auburn; 14 08 Richard Wentworth, Conway, NH. Bandits (20 laps) 1 69 John Childs; 2 11 Cam Childs; 3 13 Richard Kimball; 4 99 Paul Harmon; 5 49 Rob Lowe; 6 17 Dan Wade; 7 00 Matt Mahar; 8 87 Derek Cairns; 9 2 Shawn Hinkley; 10 22 Cody Billings; 11 82 Ben Krauter; 12 4x Dale Durgin; 13 44 Ryan Kane; 14 41x Dale Durgin; 15 14 Adam O’Neil; 16 32 Troy Smith; 17 15 Justin Green; 18 77 John Pinkham; 19 2x Dustin Salley; 20 05 Jake Hall; 21 01 Robert Kahkonen; 22 23 Jeremy Decosters; 23 8 Calvin Rose, Jr.; 24 51 Ryan Berry; 25 24 Tyler Green; 26 4 Nate Durgin; 27 3 Charlie Hall; 28 20 Ronald Parker III. Ladies (20 laps) 1 2 Shelby Lawrence; 2 26 Missy Morgan; 3 5 Michele Bisbee; 4 3 Shelby Shurtleff; 5 28 Sue Veinott; 6 29 Shannon Wheeler; 7 67 Kaley Boucher; 8 09 Beth Desrochers; 9 35 Janice Bryant; 10 54 Kristina Nadeau. OAS Outlaws (25 laps) 1 5 Chris Burgess; 2 72 Deana Bisbee; 3 67 Brady Romano; 4 28 Josh Toothaker; 5 23 John White, Jr.; 6 99 George Haskell; 7 97 Shannon Judd; 8 28x Scott Veinott; 9 85 Jason Ricker; 10 09 Mark Turner; 11 35 Dale Brackett; 12 77 Bryce Mains. OAS Runnin' Rebels (20 laps) 1 05 Gerard Cote; 2 15 Nate Dubuc; 3 17 Jimmy Childs; 4 02 Josh Straiton; 5 91 Jamie Heath; 6 82 Ben Krauter; 7 29 Robert Landers; 8 71 Chris Foster; 9 6 Cody White; 10 11 Cam Childs; 11 24 Kyia Roussel; 12 44 David Cook; 13 07 Eddie Smith; 14 4 Joe Katula; 15 3 Kyle Keenan; 16 56 Robert Landers; 17 52 Mike Nichols; 18 48 Don Smith; 19 48x Rick Harmon; 20 05x James Record. Sport Trucks (20 laps) 1 96 x Chad Binette; 2 5 Brian Darling; 3 28 Kevin Oliver; 4 69 Ryan Farrar; 5 2 Ajay Cates; 6 96 Jeremy Binette; 7 12 Gerry Mikenna; 8 07 Mark Grantham; 9 22 Jeff Schmidt; 10 24 Steve Carnignan; 11 32 Alfred Mikenna; 12 11 Eddie Henderson. 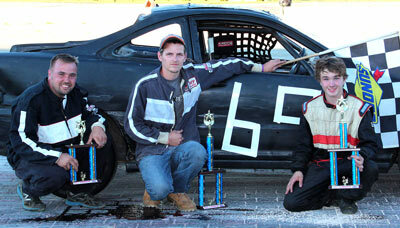 Cruisers (20 laps) 1 14 Ronnie O’Brien; 2 4 Will Dunphy; 3 72 John Poulin; 4 6 Briana Bodman; 5 11 Mickel Martin.